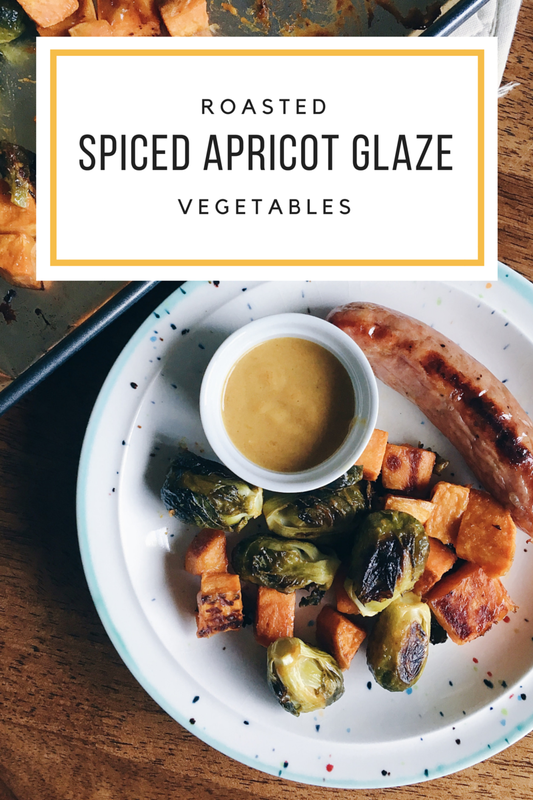 Any-who, last week I had a few nights by myself while Eric was away in Seattle and I binged on The Bachelorette, finished up season 5 of GIRLS and made this Spiced Apricot Glaze Vegetable dish for myself! I wanted to make a big batch of food for dinner so I’d only have to cook one night while Eric was gone and enjoy some easy leftovers. 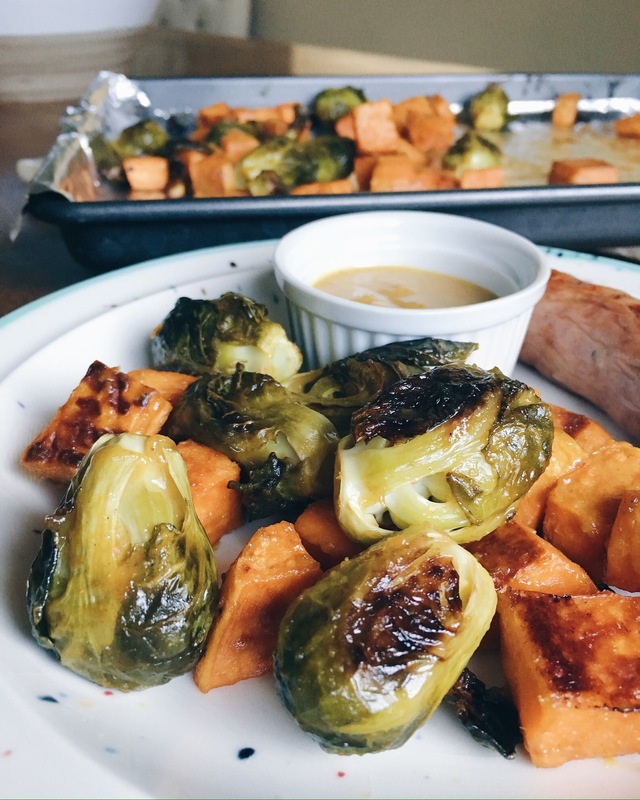 I’d been craving brussel sprouts and bought a sweet potato to go along with them and after perusing my spice cabinet, I landed on making these Spiced Apricot Glazed Roasted Vegetables. They couldn’t have been easier to make; a little wash, chop, roast, mix, roast again and it was dinner time. The finished result, browned bits loaded with sweet and spiced flavors. Served them up with some chicken sausage, for a simple and satisfying meal. It was a little bit of this and a little bit of that for this dish, but the outcome was mouth wateringly good. 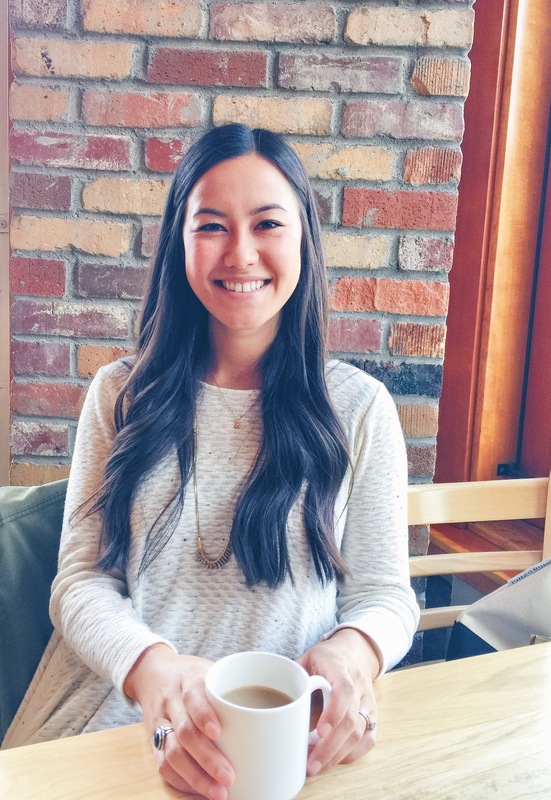 After I ate dinner that night I couldn’t wait to eat leftovers the next day! 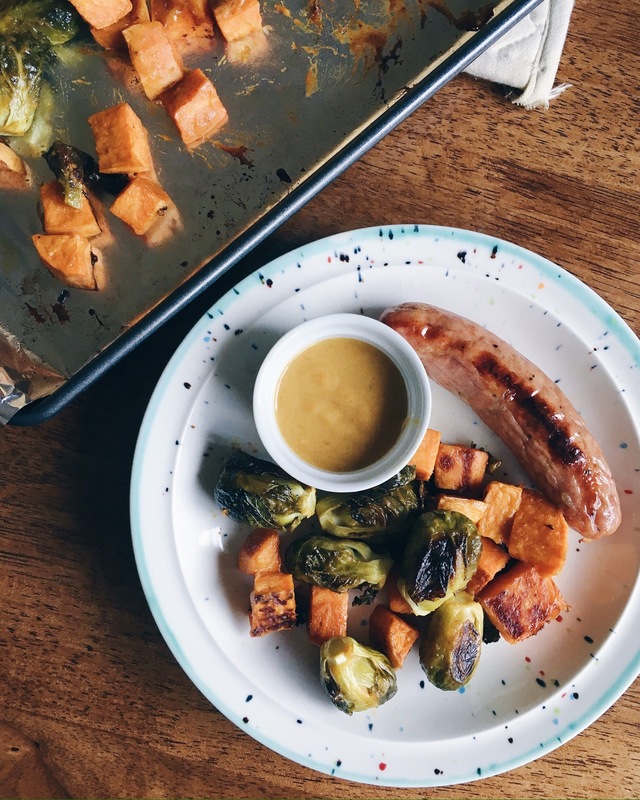 If you’re looking for something to spice up your veggie game this recipe is my recommendation. Line a baking sheet with aluminum foil, giving it a light spray of cooking oil and set aside. Wash the brussel sprouts and cut off the brown ends. 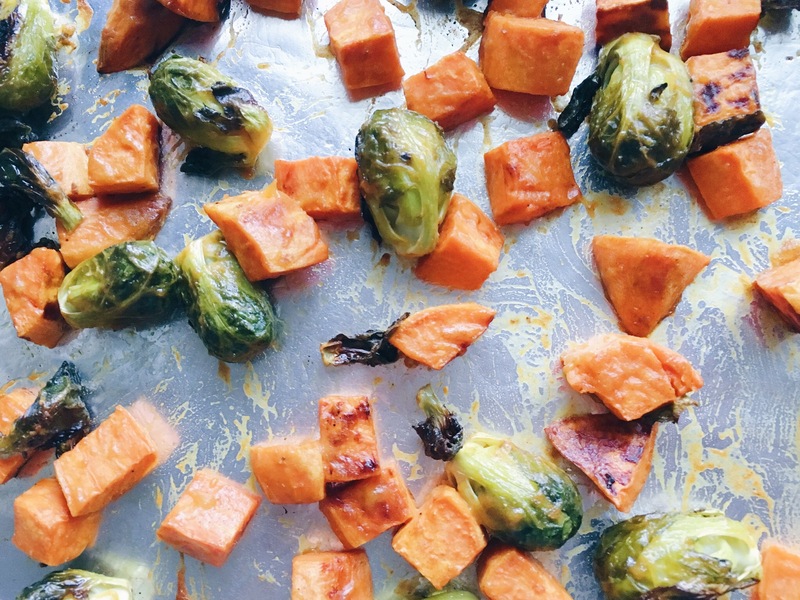 Wash the sweet potato, peel and chop into apprx. 1 inch sized cubes. 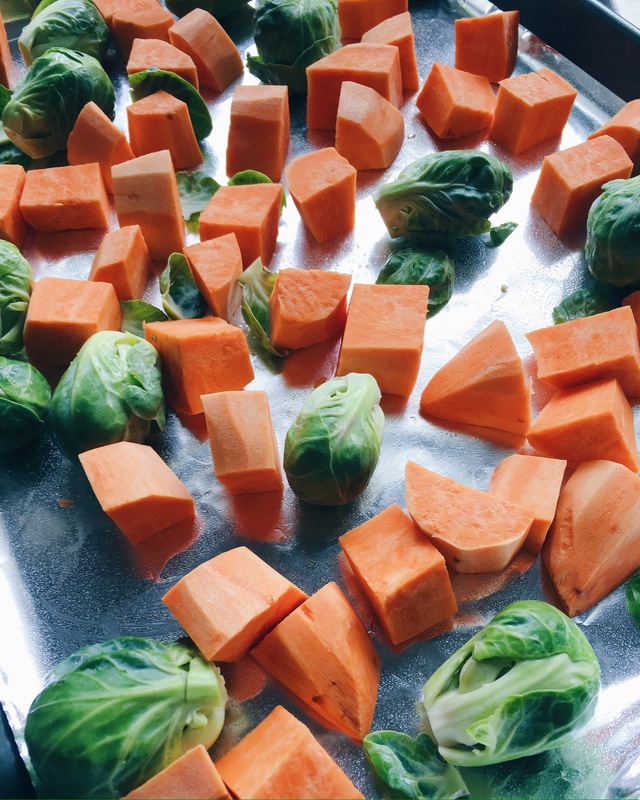 Place the washed and cut veggies onto the prepared baking sheet, drizzle the vegetables with olive oil and a sprinkle of salt. Toss to coat the vegetables, and spread out evenly across the pan. 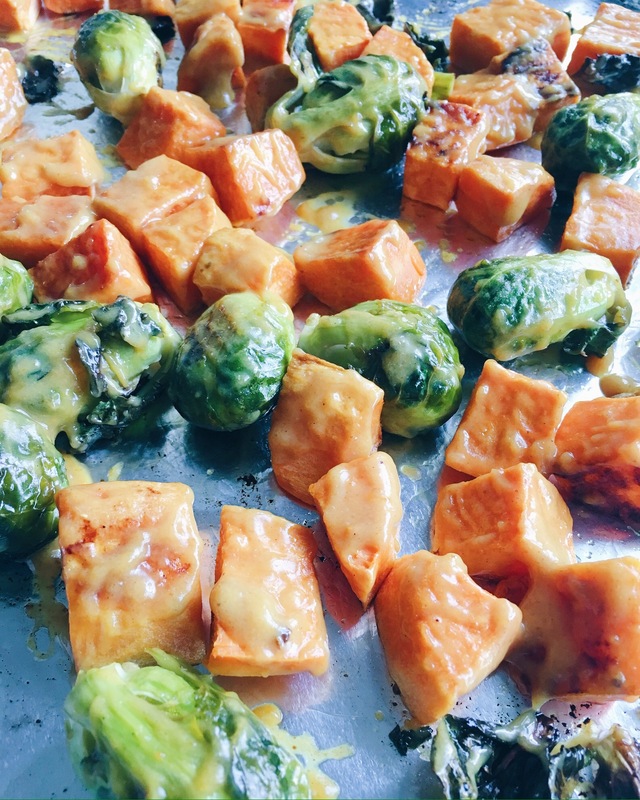 Place the sheet into the oven and roast for 25-30 minutes. Half way through shake the pan or lightly toss to brown the vegetables evenly. 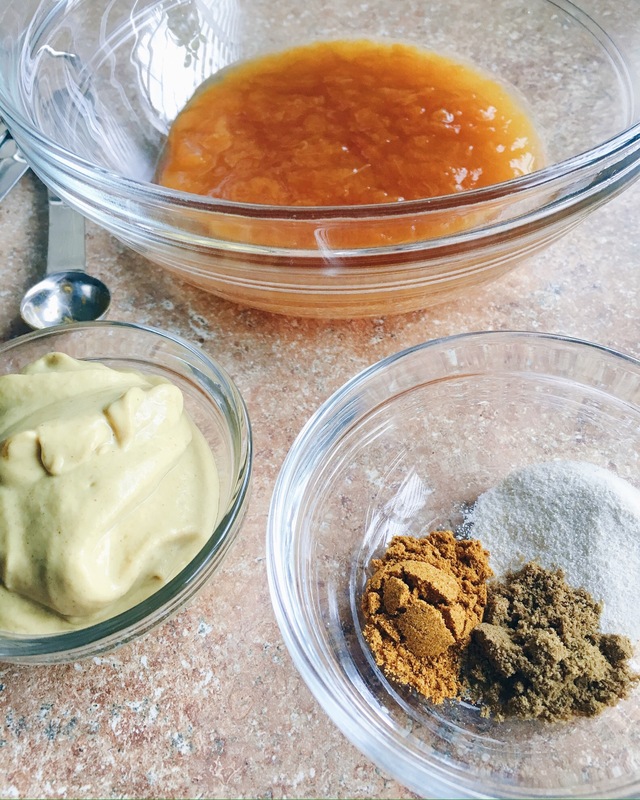 While the vegetables are roasting, in a medium size mixing bowl add the apricot preserves, dijon, garlic salt, cumin and curry powder. Stir until they are thoroughly combined. 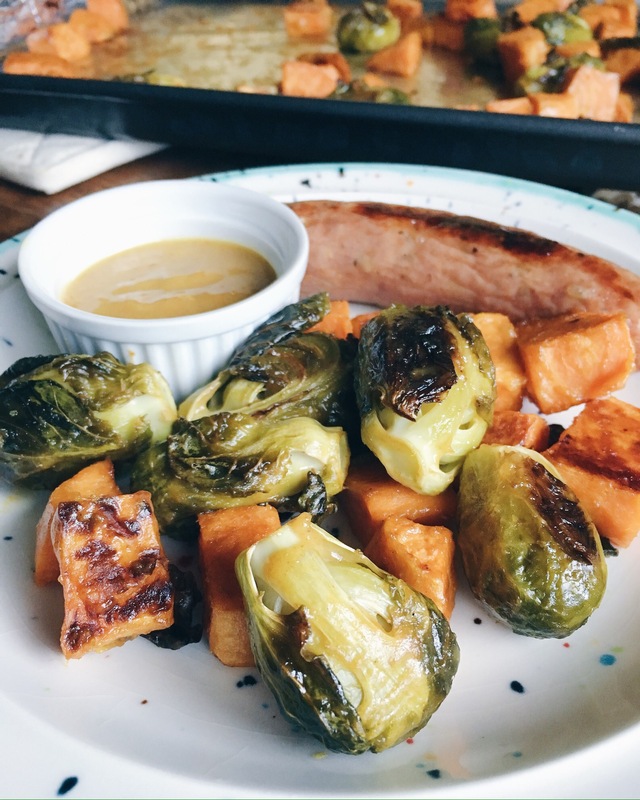 After the vegetables have roasted for 25-30 minutes, take the pan out of the oven and brush the vegetables with the glaze, making sure to get the glaze on everything, even the strayed brussel sprout leaves. 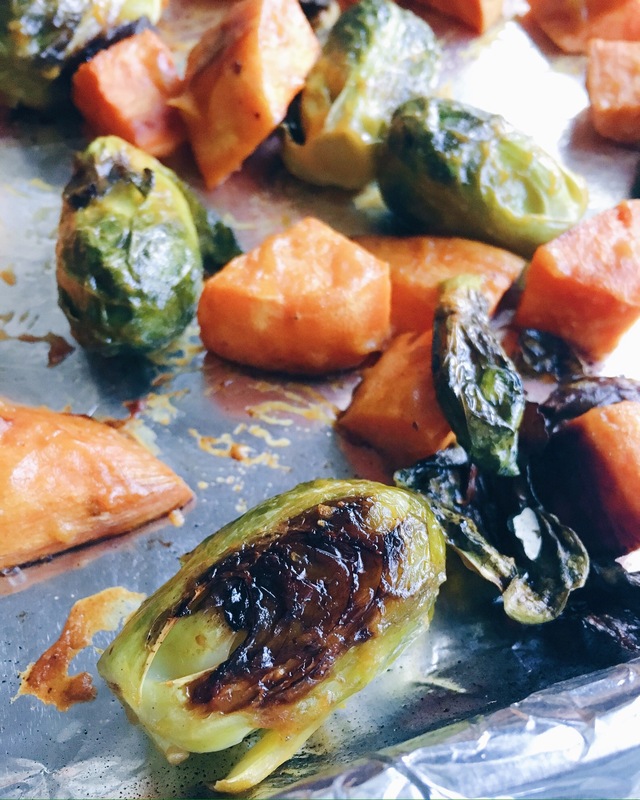 Lightly toss to make sure all of the vegetables get a coating of glaze and pop back into the oven for an additional 8-10 minutes to brown and caramelize. Once the browning and caramelizing is done, remove from the oven and serve immediately. 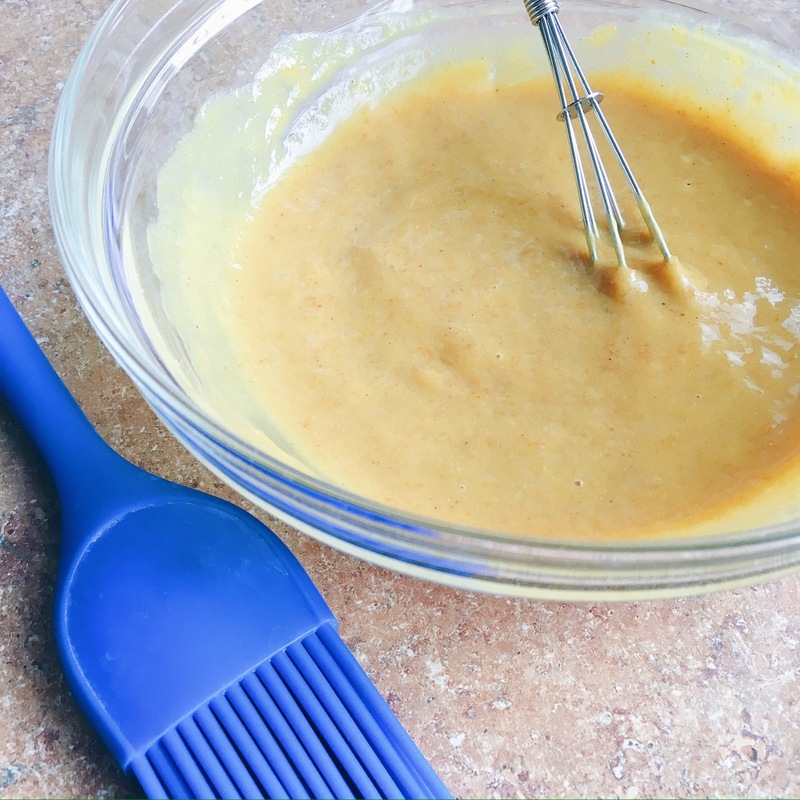 Notes: You’ll have some extra glaze leftover that can be used as a dip for the veggies or chicken. 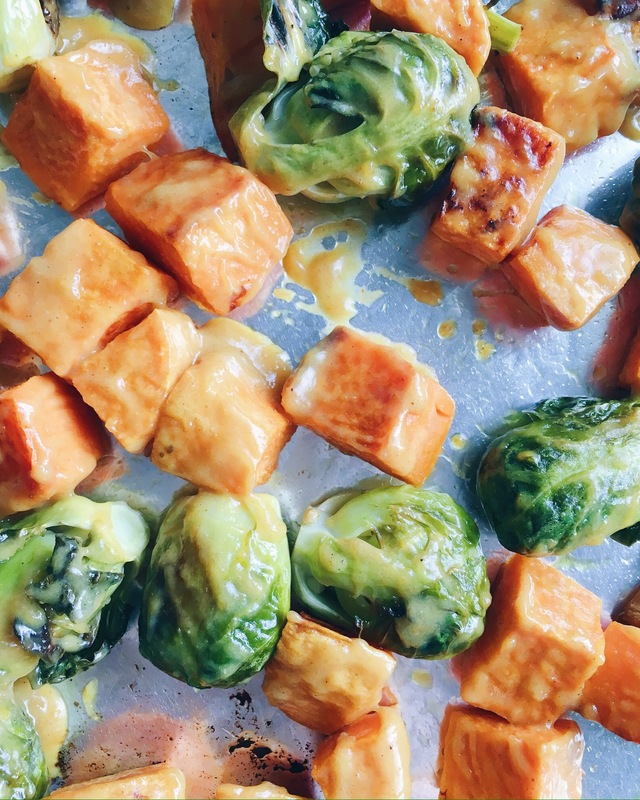 You could also double the amount of veggies and use up all the glaze in one batch.